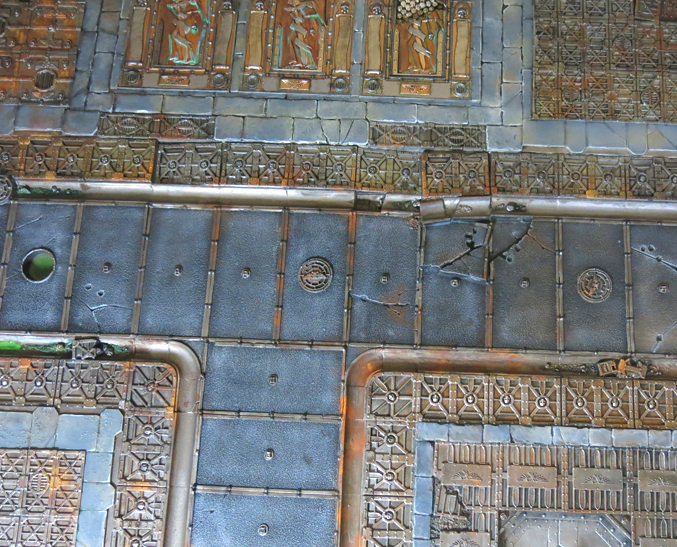 Work continues apace on adding buildings to my industrial terrain board. This time it’s the turn of a couple of mid-sized buildings, not as large as the centrepiece buildings that will dominate the board but still bigger than the barricades and other scatter terrain. Once again part of the credit for motivating me to get these done lies with Azazel and his latest monthly challenge. First up we have a thermic plasma regulator. I still have a second one of these to paint so expect to see it put in an appearance in due course. 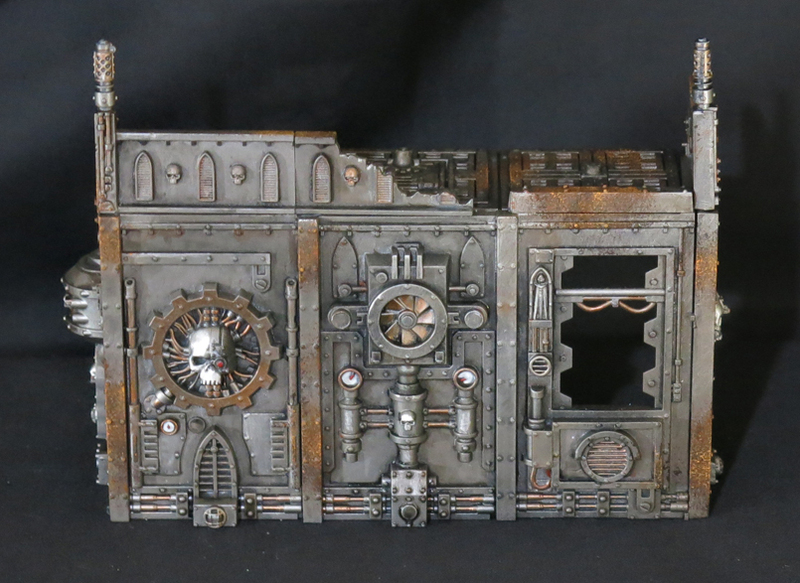 Next up we have this small ruin, made from the old manufactorum kit. I’ve had this one kicking around for quite some time so it was high on the list of things to get finished this month. 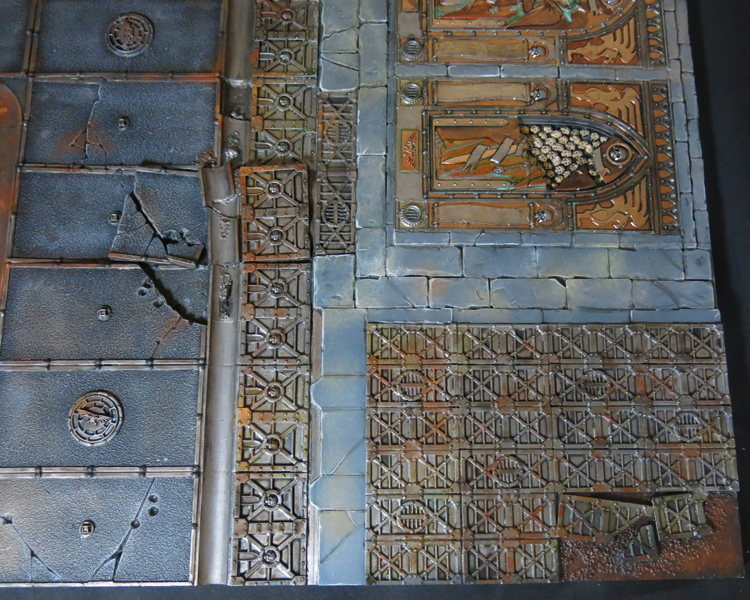 As we’re looking at terrain here’s a few other odds and ends that I’ve finished off lately. First up here’s an Ork barricade (although it’s suitably generic, I feel, to serve pretty much anywhere, including Necromunda which is probably where it’ll see most action). 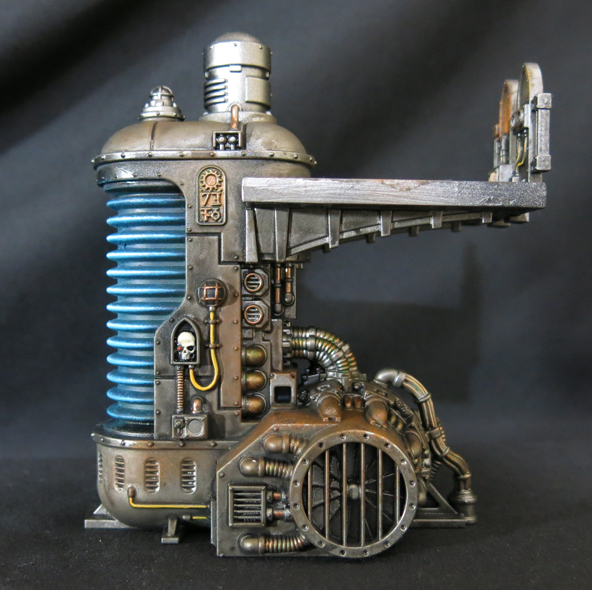 Just to prove I do occasionally paint things for games rather than just for the hell of it, I also painted up this escape pod as an objective marker. I didn’t go too mad on it, just enough to make it look nice on the tabletop, as I don’t imagine it’s something that anyone, even me, will really pause to admire, but hopefully it’s good enough to serve it’s purpose. All in all I think I’ve made fairly solid progress on terrain this month and there’s plenty more in the pipeline (indeed, some of it even contains pipelines). Here’s the board as it begins to take shape. Next up will probably be another large building, although I’ve got a few other projects I want to wrap up first so it may not appear straight away. Still, with the Underhive now well on its way to becoming a reality I’m keen to press ahead and get more done with it soon. Here’s one last goliath to add to the Irondogs gang for now. I actually have several more assembled and waiting for paint but I’m keen to crack on with other gangs and projects for a while. Equally I didn’t want to leave Sylus here half-painted and gathering dust when he could be raising merry havoc in the Underhive. The eagle-eyed will have spotted that I’ve used the bolter from the upgrade sets, after talking myself into buying Weapon Set 2, and this, combined with the glorious new heads from Forge World, undoubtedly means another wave of recruits for House Goliath will be stamping across my painting desk sooner or later. Some models are just so cool they jump straight to the front of the painting queue. As soon as I heard that my Goliath gang could have a pet crocodile accompany them through the Underhive I wanted one and the model, when it arrived, didn’t disappoint. There is something about a sumpcroc which is wonderfully in keeping with the concept and aesthetic of the Goliaths. You just can’t get more bullishly aggressive, more arrogantly macho, more imposingly belligerent, than walking down the street with a crocodile lumbering along at your heels. Plus I’m sure she counts towards Azazel’s latest monthly challenge! Meet Korak’s loyal pet, and the unofficial mascot of the Irondogs gang, “Snuggles” the sumpcroc. She really is a big beast, even in comparison to the rest of the gang. Next to a humble guardsman, who’s probably only moments away from being eaten, she’s positively gigantic! Of course, she’s not the only monster lurking in the Underhive… Watch this space! For over a decade I’ve harboured an ambition to own my own terrain board. Surely for many hobbyists this is the big one, the ultimate goal to aspire to. If you’re a keen gamer then what better than to be able to roll dice in style within the comfort of your own home? If your predilections lie more towards the painting and modelling then what project can compare to capturing not just the characters that inhabit your chosen world but the actual world itself? The downside of course is that it’s expensive, it takes up a lot of space and it’s a lot of work to build. Leaving aside the lack of disposable income, which in itself lead to a lot of careful budgeting and saving up, until recently I just didn’t have the room to store such a comparatively massive construction. However at the end of the day life won’t wait. I’ve been made keenly aware over the last year or so that whilst planning for the future is a very sensible and intelligent move, putting off all your plans to an unspecified future date might just mean they never happen at all. Having managed to set aside a space in the house for it occupy I’ve set about building a section of Imperial cityscape. Building a terrain board isn’t like other hobby projects. It takes a certain amount of preparation and self justification before you even think about spending all that money (assuming of course you’re not one of those geniuses who can make a convincing fusion reactor out of an egg box and a Pringles tin, which I am most certainly not). Having convinced myself, with some difficulty, that it was ok, and that buying a few model buildings wasn’t the sort of fiscal irresponsibility that would see me reduced to fighting the other tramps for food in a matter of weeks, the next question is; what kind of board to build? Of course the answer to that very much depends on the kind of games it might be used for. The fantastic landscapes of the Mortal Realms may look amazing but my heart still lies in the 41st Millennium. 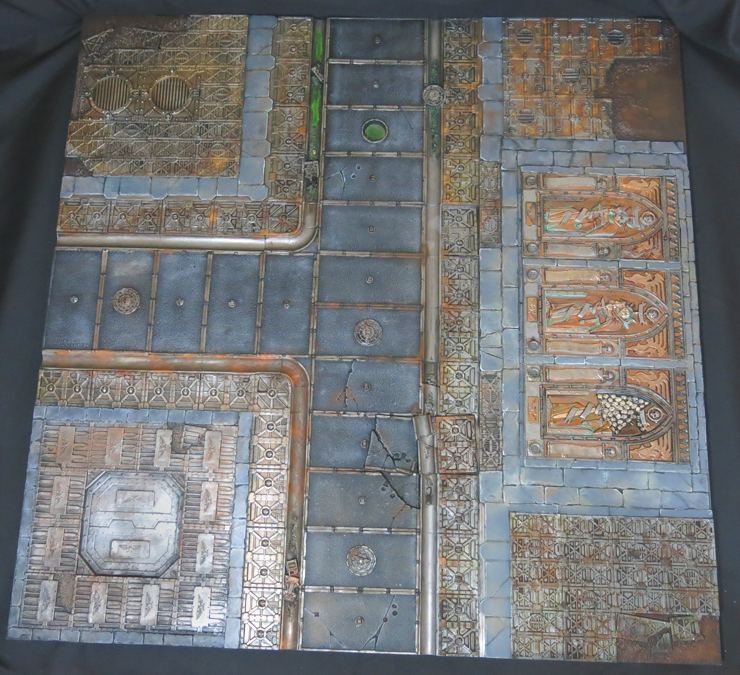 You can keep the flyers and tanks of 40k proper, I lean towards Necromunda, Inq28 and perhaps a little bit of Killteam so my board in turn will be the close-packed warrens of the Underhive, the decaying depths of a crumbling Imperial city where Inquisitors roam and gangers hold sway. 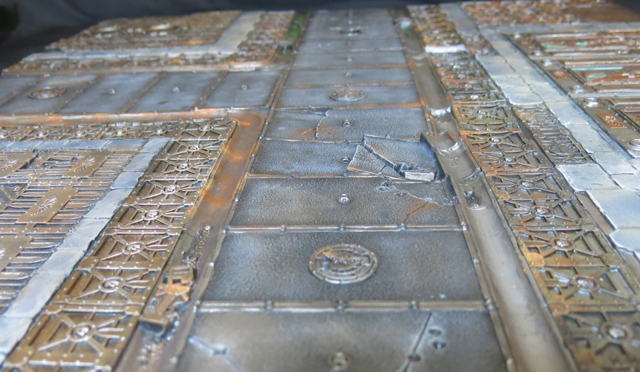 In spite of my recent resurgence of interest in building this board its story actually began a few years ago when, following some kind of fit of fiscal frivolity, I bought myself the Sector Imperialis board from GW, and then froze like a rabbit in headlights and never painted the damn thing. Instead it just sat there, a brooding avatar of my decadence, lurking in the corner of the room to guilt me. No more I say! We’ve scowled at each other long enough, time to set aside our differences and get some paint on it. After all I may have spent rather a lot on it, and I may have regretted it afterwards, but the deed is done, I may as well enjoy it! For the last few months, in between other projects, I’ve been chipping away at it and at last the first section is ready to show off. 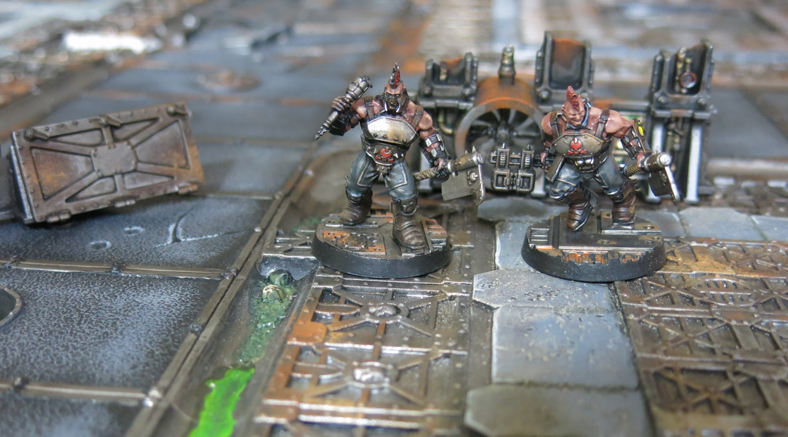 Rukk and Grak set out to explore the crumbling deaths of their territory. 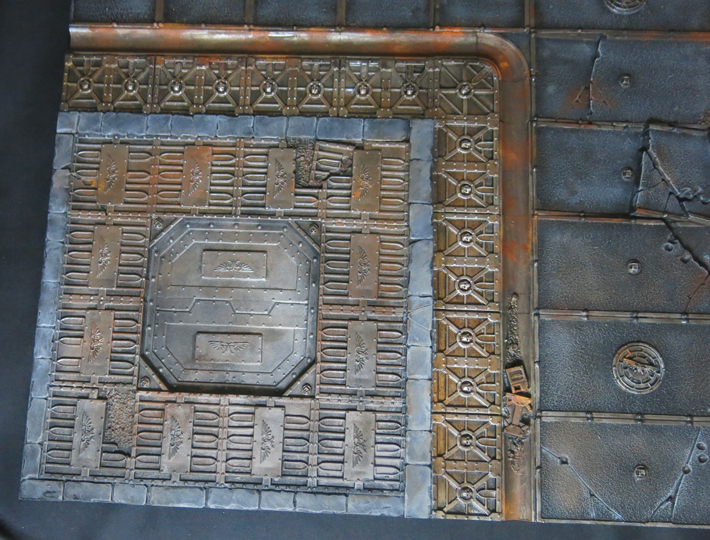 Over the coming months I’ll keep working away on this, adding the rusty, crumbling buildings and industrial structures of the Underhive’s heart. Naturally a project like this takes time (or at least it does if you happen to be me, I know some people power through terrain projects like they’re going out of style but alas my progress tends to be rather slower). Nonetheless keep an eye out and hopefully soon a city will begin to grow here. Well isn’t that always the way? You spend 30 years waiting for a rogue trader and then two of them show up at once! Yes, it’s time to take a look at Blackstone Fortress, the latest of what now seems like a tidal wave of boxsets to emerge from GW over recent months. From a rare glimpse of a robot in 40k to a pair of Rammstein loving hobbits this one really does have everything you could ask for! Naturally I couldn’t pass up the opportunity to enthuse a little, after all with pre-orders running for a fortnight I’ve got to pass the time waiting for it somehow right? For those who’ve been living under a rock, or who’ve somehow found a way to hide from the Games Workshop hype machine (and well done if you have – that’s no easy task!) 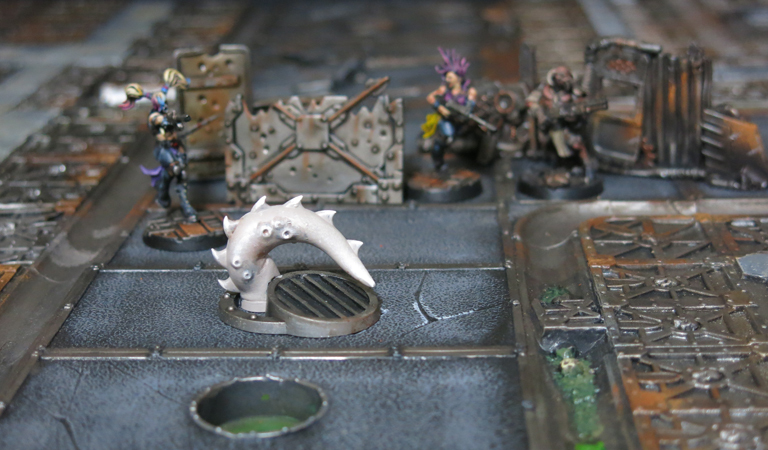 Blackstone Fortress features a band of explorers braving the twisting and labyrinthine depths of the aforementioned fortress. Best of all it features a whole raft of new models including lurking ghouls, ancient robots (of various descriptions), a small army of Chaos worshippers (enough to get me inspired by themselves) and of course the various roguish, self-serving troublemakers who act as the “good guys”. Let’s take a look at them first. Every mysterious dungeon needs a party of brave adventurers to explore it, a ragtag band of unlikely heroes with clashing personalities and questionable motivations bound together by a common cause. Rather than fall back on old tropes GW have seized the opportunity presented to them and furnished us with a veritable smorgasbord of characters from the shady corners of the universe. Much like Necromunda this offers us a peek into the wider world of 40k, the individual heroics of people just going about their lives away from the monumental struggles of Space Marines, Titans and Primarchs. Even more so than Kill Team; Rogue Trader, which similarly brought us a small band of heroes struggling against the machinations of Chaos, this is GW flirting with everything good that the Inq28 scene brought to the feral underbelly of the setting and for that reason alone it’s worth celebrating. It also demonstrates a willingness on their part to explore what can be done with warbands made up of just a handful of characters, rather than the massed armies we’ve become used to. Surely two boxsets in as many months mean this is more than just a passing phase for them (backed up by repeated assertions that both Blackstone Fortress and Kill Team will receive further updates in the future)? Where might they go next? Suddenly even an inquisitorial retinue in plastic doesn’t seem unimaginable. 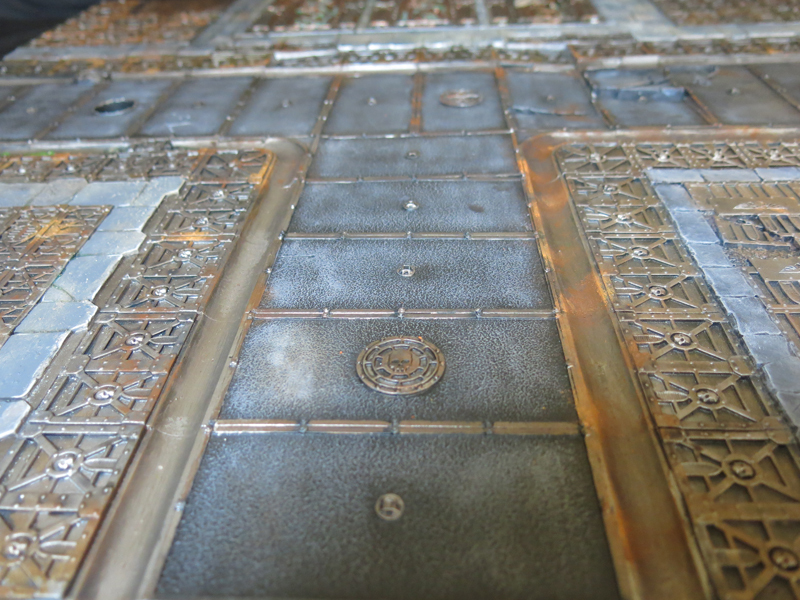 One of the glorious things about Necromunda is the way it has kept its focus narrow (a product of the long established setting but welcome nonetheless). In the past GW ran global 40k campaigns in which every faction would end up fighting over a single planet, a veritable circus that strained the credulity of even the most enthusiastic fan. Vigilus is starting to head in that direction too, although as the gateway to the Imperium Nihilus at least they’ve come up with a good excuse. 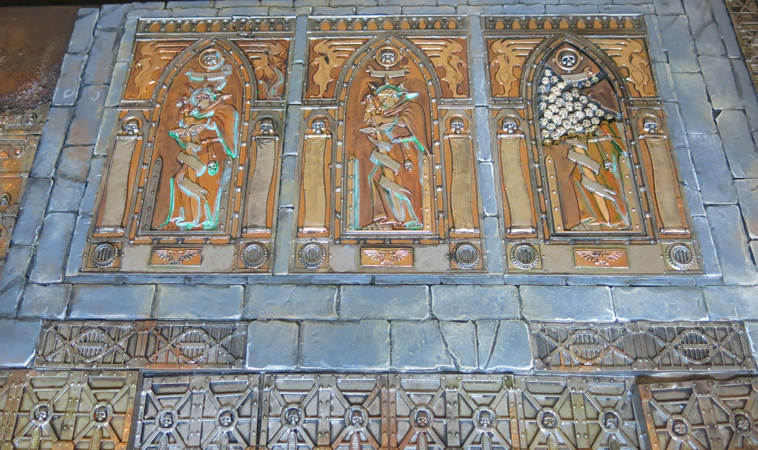 For the most part Necromunda has kept its focus on Imperial humans, the occasional xenos or chaos cultist notwithstanding, and so has allowed us to see the true depths of culture present on a single planet in the 41st Millennium. Consider how many thousands of planets exist within the Imperium and the creative potential is jaw-dropping. 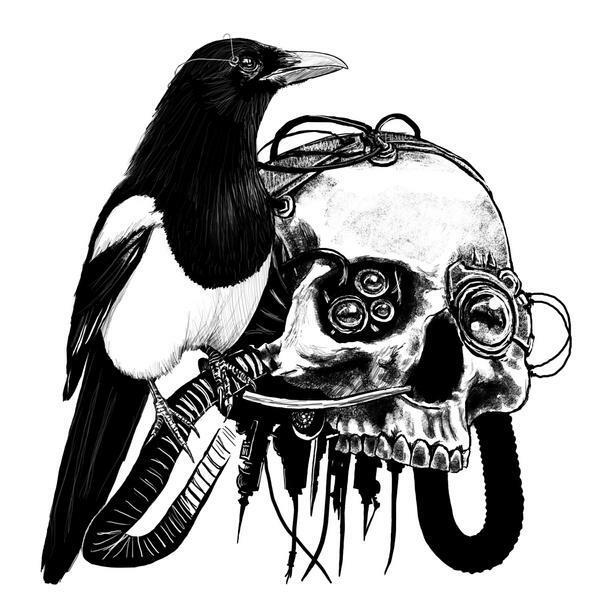 Blackstone Fortress indulges a different take on this theme and broadens its scope to include various xenos and abhumans, even a robot, whilst still avoiding the temptation to throw in one of everything. 40k is home to an eclectic mix of cultures and species, yet all too often this has boiled down to little more than various colours of Space Marine. Here we see a real slice of life in the 41st Millennium, the sort of scum and villainy to be found in any Imperial star port, and just as the characters in the game explore a new corner of the universe so these models explore the kind of characters previously reserved for background fiction and artwork. For a perfect example of what can be done with this look no further than the two characters who, between them, reflect differing aspects of the Imperium’s state religion. On the one hand we have Taddeus the Purifier, a well dressed figure clearly used to the better things in life who undoubtedly consumes in a single meal more than a family of hive workers do in a month. Meanwhile Pious Vorne is marked and driven by her faith, a restless crusader whose devotion to the God-Emperor compels her to a life of hardship and violence. Suffice to say I’m hopeful we’ll see more models in this style when the Sisters of Battle put in an appearance. Top marks to GW also for the degree to which character and personality have been poured into these models. You can almost hear the bombastic oratory of Taddeus whilst that sharp-dressed man, the Rogue Trader Janus Draik simply oozes self-serving arrogance. The Kroot mercenary meanwhile has the confident professional bearing of the career soldier – this won’t be the first danger filled space station he’s found himself employed to explore. Between them, our party band serve as a valuable reminder of the untapped potential still existing in 40k. Kroot mercenaries, navigator households, rogue trader fleets, even ratling militias (don’t laugh, it would be awesome! ), could someday be expanded into full armies. As the range fills out GW are once more able to look beyond they’re power-armoured bread-and-butter and this little lot hints at the range of options still open to them for future exploration. Robots are a rare sight in 40k, the wars against the Men of Iron back in the Dark Age of Technology having rather soured humanity on the question of Abominable Intelligence. Thus UR-025 presents us with something rather interesting, and with photos of its background fiction circulating online many people will be aware of his true origins and motivations. I’ll keep my comments brief but anyone wanting to save the surprise for when they open the box should skip the next paragraph. Speaking of robots, aren’t these intriguing little beasts? As anyone who, like me, spent several years in their late teens and early 20s immersed in the Halo universe will be aware, when a mysterious ancient race leaves behind a huge space station that doubles as a super weapon they make sure to leave it staffed by little robot drones. Smoothly mixing together clean organic lines with sleek technological components these little chaps blend together elements of the Eldar and Necrons to give us our first real glimpse of the Old Ones. Hopefully this will remain our only glimpse – it’s enough to savour this tantalising peak at the shadowy forerunner race, anything more would spoil the mystery. Formerly known best from the courts of the Dark Eldar, where they serve as savage pets, the Ur-Ghuls appear to be living as feral denizens of the Fortress. Quite what they were eating up until now is best left to the imagination but luckily a whole mob of characters have turned up which should help to fatten them up nicely. Seeing them here is great of course, and beyond Blackstone Fortress they’re sure to come in handy as Inq28 adversaries and Underhive baddies alike. It’s unfortunate then that their poses are so strange, awkward and samey. Anyone looking to convert an all ghoul cheerleading squad need look no further but personally I’d have preferred more personality here, perhaps crouched ready to lunge or hackles raised as they face the unfamiliar glow of the explorer’s lamps. Of course a good adventure story needs serious villains, a crew of baddies racing for the prize and presenting a more challenging prospect for our heroes to overcome than can be mustered by mere ancient robots and dancing ghouls. Enter those perennial rascals, the forces of Chaos. Abaddon the Despoiler has demonstrated a real enthusiasm for Blackstone Fortresses in the past, launching entire Black Crusades just to claim them, and sure enough his boys are here to stake a claim to this one. Once again GW haven’t been backwards in taking the opportunity to explore some of the less often seen aspects of their worlds. Just as space marines are willing to turn their backs on the God-Emperor and embrace instead the Ruinous Powers so too are regiments of the Imperial Guard. Traitor guard have long been popular amongst fans of Chaos with many of us going so far as to convert our own. For a long time the only official support for our endeavours was Forge World’s upgrade kit so there were rumblings of disquiet when these were retired earlier in the year. Now however all is (mostly) forgiven. After all, these models are simply gorgeous and worthy inheritors of the role left vacant by the outgoing Forge World kit. A common criticism of the Imperial Guard range is the way in which most of the infantry only pay lip service to their place in the 41st millennium. The same however cannot be said of their rebellious colleagues. The 40k aesthetic is writ large here in their ragged blending of the post-apocalyptic and the medieval, the spiky and the impractical. The baddies of the Rogue Trader box had a slightly cartoony aspect to them, nothing which couldn’t be turned down by a suitably grubby paint job but present nonetheless. This little lot however are far more subtle yet also distinctly darker, Blanchian straight out of the box as it were. They may not have trailing guts and explosive mutations but they’re equally villainous in appearance. Ragged capes, furs, chainmail and gas-masks abound. The only downside is the fact that two identical sprues are included, leading to a squad made up entirely of twins. As with the Poxwalkers of Dark Imperium, and the Chaos Cultists of Dark Vengeance before that, I’ll be treating this as a challenge and trying to convert every single one of them into an individual. I’ve always had a real soft spot for the beastmen. For a while it looked like they might be excised from 40k altogether, vanquished like the squats and genestealer cult limos to a faintly embarrassing chapter of the history books that speak of a time before 40k learnt to take itself seriously. Thankfully beastmen and squats are back (and best of all genestealer limos aren’t!). Better yet these aren’t just a rehash of fantasy beastmen with guns. In the old days beastmen came in all shapes and sizes, as befits creatures of Chaos. For many years however we saw only goatmen, Panish creatures with a stable morphology. Long faces, hoofs and horns were in, other bestial characteristics were out. The appearance of the Tzaangors suggested that this era might be coming to an end (and not a moment too soon). These newcomers don’t diverge as far from the goats of recent years but they put a sufficiently different spin on things to suggest that GW are warming up to the idea. Plus they look wonderful fearsome and savage. More please! Meanwhile the rogue pyskers follow on from the Nighthaunt to really demonstrate what can be done with modern plastic models. In what is a very clever piece of miniature design they appear to be floating, their robes flapping as they are borne aloft by the unnatural powers at their command. Especially praiseworthy is the way the two of them are so radically different in appearance, whilst still being built from the same base model with just a few swapped components. Beyond being cracking miniatures in their own right (and perfect for witches in Necromunda) these should also make for fine Daemonhosts for those radical Inquisitors amongst you. Chaos is us. It is our own nature twisted and turned back at us, and it’s weapons are our better instincts, our fears and aspirations, all clawing at us and dragging us down to hell. As a matter of course therefore any Imperial institution will almost certainly have an equivalent amongst the servants of the Primordial Annihilator. 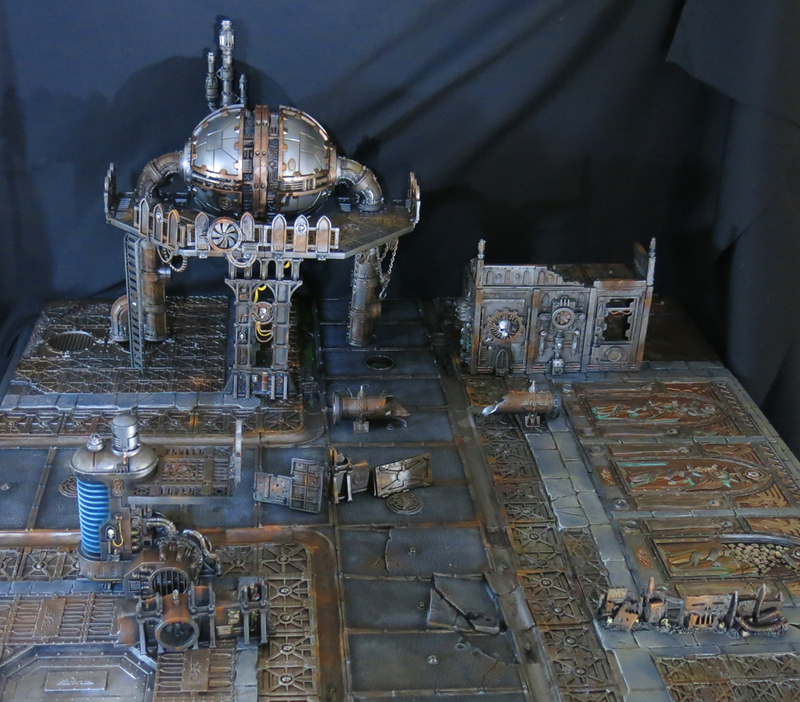 Just as there are Heretic Astartes, traitor guard and renegade knights, so there is a Dark Mechanicum. Until recently however even the loyalist worshippers of the Machine God had no official models. Only since their arrival in 2015 has the idea of seeing their daemon-binding former colleagues on our tabletops begun to glimmer with distant possibility. 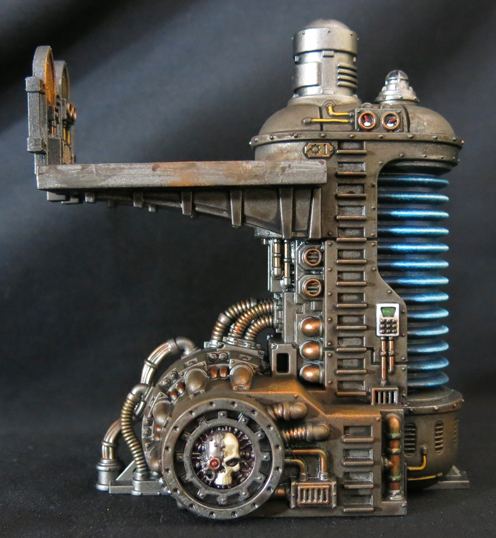 Once again GW give us a taste of what might someday come to be with the Negavolt Cultists. The first thing that struck me about these, and perhaps my favourite aspect of them, is that they are not grossly Chaotic. Indeed compared to the loyal soldiers of the Mechanicum they’ve retained much of their human form. They still have their own arms and legs and all the other normal human accoutrements that most of the loyalists have long since done away with in favour of becoming giant mechanical centipedes. Indeed beyond what appear to be ocular dreadlocks these guys don’t have too many inbuilt machines at all – probably a wise move as their cult is dedicated to destroying and corrupting machines wherever they go! 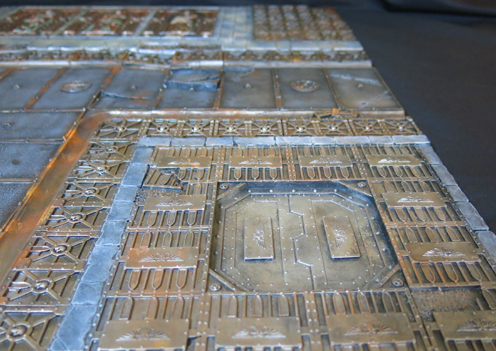 Despite these differences they are instantly recognisable as a sect of the Mechanicum. Paint them in the red robes of Mars and they would fit in fairly well with a loyalist army, far more so than say a plague marine would amongst the Ultramarines. It may be that these are another sign of things to come, or equally this could be an evolutionary dead end, a splinter cult which will never be developed any further than this even if the Dark Mechanicum become a fully fledged range in time. Either way they’re an interesting twist, even if those head tentacles look set to be a monumental faff to paint. If it wasn’t for the Black Legionaries one could almost headline this as “40k boxset in no space marines shock!” (and yes, I know the same could be said of Rogue Trader, don’t try to use facts against my cheap mockery!). Speaking as a Chaos fan these are some of the most interesting models to appear here, representing as they do our first hint as to what a future Chaos Marines kit may look like. Power armoured warriors on both sides of the heretic/loyalist divide have enjoyed an eventful couple of years. For a very long time Games Workshop’s most popular line suffered from a fairly monumental flaw which the company seemed doggedly determined to ignore; namely that they appeared to be in an entirely different scale to the rest of the range. Whilst the background described the space marines as warrior-giants, genetically reforged into towering heroes, the actual models stood roughly the same height as an a normal guardsman, even clad as they were in thick plates of armour. Eventually GW got the finger out and decided to do something about this ridiculous situation. The Thousand Sons and Death Guard both saw releases of more sensibly scaled models, although the former do still have a few issues which need to be overcome, namely a distinct lack of lower torso and a general slimness of build. Mind you, who needs organs below the ribs when you’re made out of dust? Plus the Death Guard have more than enough guts for everyone! Whilst the traitor legions grew significantly in stature the loyalists did likewise, although fans waking up to discover that their existing models looked like children next to the new boys were at least offered the sop of some controversial new background involving a reborn Primarch and a 10,000 year mission to achieve what the Emperor could not and make the space marines tall. It’s something that I’ve discussed often on this blog so I won’t rake over it all again. 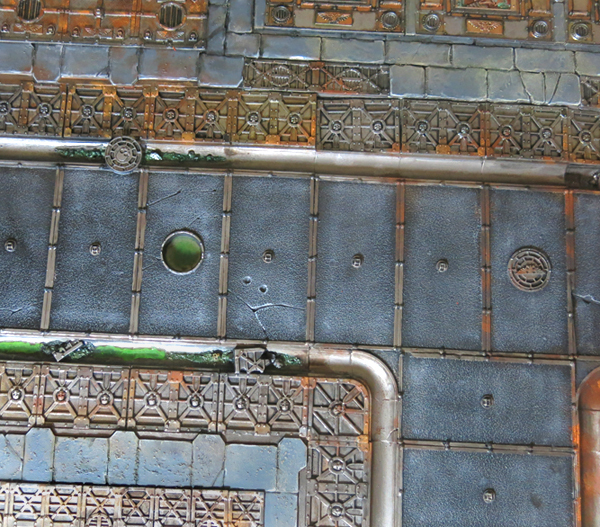 The upshot is however that the old chaos space marine kit is left looking somewhat on the short side. Naturally this has led to an increasing desire from fans to see the vertically challenged and chunkily sculpted marines of yesteryear replaced with something a bit more imposing. Whether or not a new kit, or even a revamp of the whole range, really is on the way on if this is all just wishful thinking remains to be seen but with these three warriors we at least get a taste of what could lie ahead. As yet it’s still early days for these models. Once I have the set in hand I’ll sort out some comparison photos, assuming a surfeit of them haven’t appeared online already, allowing a proper assessment of their portions alongside their brothers in the Death Guard and Thousand Sons – as well as the Corpse Emperor’s Primaris lap dogs of course! Needless to say if they prove to be smaller than they should GW will once again have an army of grumbling Chaos fans on their hands. As it stands it appears that, as with the Death Guard, the bulkier armour of the Black Legion – as opposed to the slim fit Thousand Sons – hides a multitude of sins in the lower gut area, an element further disguised by their ‘at ease’ pose and low help bolters. Until I have the models in front of me I’m cautious to say more but needless to say of all the miniatures in the set these are the ones I’m approaching with the greatest uncertainty. The models themselves are nice enough, recalling the more recent Chaos plastics such as the Raptors and Chaos Chosen (both kits sadly hamstrung by their diminutive scale). As an aside it’s also pleasing to note that the chaos space marine contingent is limited to just three figures. In this way these veterans of the Long War are really given their place as set out by the background. Here we have warriors who’ve been fighting to survive in hell itself for ten thousand years. Three should be more than enough to present any party of adventurers with a serious problem. Overall then I think GW nailed it here. They’ve walked a tightrope, pouring in an eclectic mix of units whilst keeping the focus sufficiently tight that the whole thing didn’t turn into a circus. I’m sure I could be accused of being a little fan-boyish and in all honesty that’s probably not too far from the truth. The world of 40k tournaments, rules beards and min-maxed death stars has always left me cold, and titanic clashes between space marines – whilst thrilling in small doses – represents only the surface layer of the universe. Give me gangs in the Underhive, give me Inquisitors and their retinues, give me rag-tag bands of mismatched adventurers chasing secrets in the grubby shadows; that’s the 40k I love best! It’s often said these days that to guess GW’s future look to the past and in this respect the Blackstone Fortress box is almost a synopsis of where they are now, hinting at possible next moves whilst offering a respectful nod to what went before. It’s just a shame they didn’t include a Zoat! Naturally (and having given it such a glowing review you might have guessed as much already) I’ve declared “hang the expense” and pre-ordered a copy, so expect to see plenty of models from this set popping up here over the coming months. Of course I’m always curious to know what you think. Has your unhealthy obsession with Space Hobbits led to you camping outside the store already or would you have preferred to see some more support for the terminally overlooked space marines? Share your thoughts – the God Emperor’s Holy Inquisition demands it!